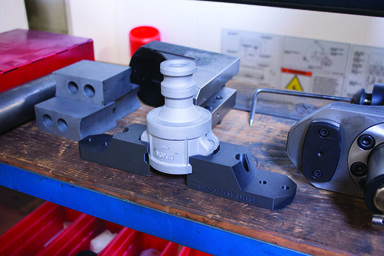 Dixon Valve & Coupling uses the Mark Two to 3D print custom jaws for industrial robotic arms on their factory floor. 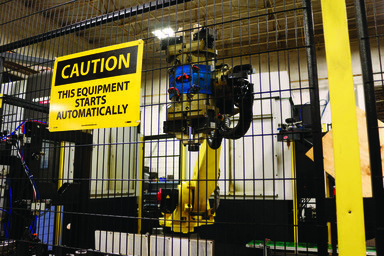 An industrial FANUC robotic arm gracefully swings from one automated machining center to another with a pipe fitting firmly gripped between its jaws. At Dixon Valve’s US manufacturing facility in Chestertown, Maryland, these robotic arms are commonplace in production line cells, used for part transfers in the manufacturing process. 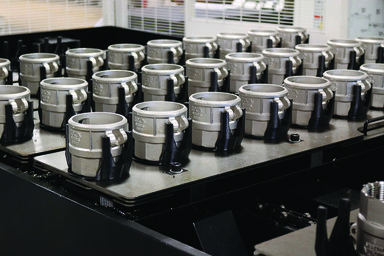 Strength, safety, and chemical resistance are key components to Dixon Valve’s efficient work environment, and as such attached to the arm of each robot is a set of Onyx jaws, printed on the Mark Two industrial strength 3D printer. A two jaw gripper set for a pipe fitting. “Dixon Valve is a manufacturer of fittings for fluid transfer industries,” Max de Arriz, Manufacturing Engineer at the company, explained. “We’re using a large robotic arm to transfer many styles of our parts between two vertical turning centers.” With the thousands of different valves, fittings, and gauges that the company manufactures, each product line setup requires custom equipment, including tooling and grips to hold specific parts efficiently. De Arriz, along with Automation Technician J.R.Everett, reap the benefits of their Mark Two in Dixon’s production facility. Dixon Valve pipe fittings in the factory aligned with 3D printed fixtures. “Prior to using 3D printed jaws in the cell, we were machining each tool individually, and it would take a fairly large amount of time,” de Arriz explained. Every gripping tool needed to be either outsourced to an external machine shop or machined in house with the manufacturing capabilities at hand. Either way, manufacturing parts as critical as production line grippers was getting time consuming. As Dixon primarily produces valves and fittings, these grippers also require strength and chemical resistance, as well as wear resistance from repeated use. “To that end, we utilize the Markforged parts as our transfer gripping system,” de Arriz concluded. A robotic arm with 3D printed grippers working on the Dixon Valve factory floor. A new set of jaws can be made on the Mark Two in less than a day.